Hello everyone! 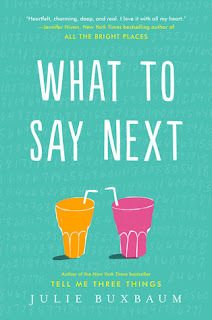 Today I'm sharing an interview with the lovely Julie Buxbaum, as part of the blog tour for What To Say Next. This book is Buxbaum's second YA contemporary novel and it is such a wonderful story. Don't miss it, publishing on July 11th! Alyssa: Hi and welcome to The Eater of Books! So glad you could join me today to celebrate What to Say Next. =) What was the inspiration (or inspirations) behind this book? Julie: I loved the idea of writing a story about two people who had pre-conceived notions about who the other was, and then connecting and surprising each other. I started with David’s voice. And then Kit popped into my head. It was a lot of fun to sit back and watch them interact. Alyssa: How was writing What to Say Next different compared to writing Tell Me Three Things? Julie: What To Say Next required way more research than Tell Me Three Things. I knew that if I was going to represent someone on the spectrum, I needed to make sure I did so respectfully and responsibly. Alyssa: I personally think you did just that. =) I know the publishing house has complete control over covers and designs. Do you know what went into the decision to change the color of the cover of What to Say Next? What are your thoughts on the covers (old and new)? Julie: I much prefer the new cover. The purple on the ARC, while pretty, felt a little too muted to me. With book covers sometimes it’s not about what looks best, but what will pop on a table full of other books. I was worried that the original cover wasn’t loud enough. The final is bright—I love that blue—and the font is cleaner. Julie: This book has had a million different titles! My personal favorite, that everyone else uniformly hated, was Instructions for Dancing, which was taken from the Magnetic Fields’ song The Book of Love. Still, I think What to Say Next ultimately really suits and fits the book. Alyssa: LOL! Agreed! What’s another 2017 YA contemporary that you’ve really enjoyed and would recommend for fans of your YA books? Julie: I really enjoyed When Dimple Met Rishi by Sandhya Menon! Alyssa: I loved that book so much. :D What is one message that you’d love young readers to take away from What to Say Next? Julie: This is essentially a story about two people finding the person they need the most in the place they least expect to find it. I’d love for young readers to realize how important it is to look beyond first impressions and judgments. Alyssa: Can you tell us anything about any new YA projects you’re working on? Julie: AHHH! I’m on deadline for a revision for my next book, which will hopefully come out Spring 2018. All I can say at this point is that it’s another YA standalone. Julie: Thank you so much!!!! 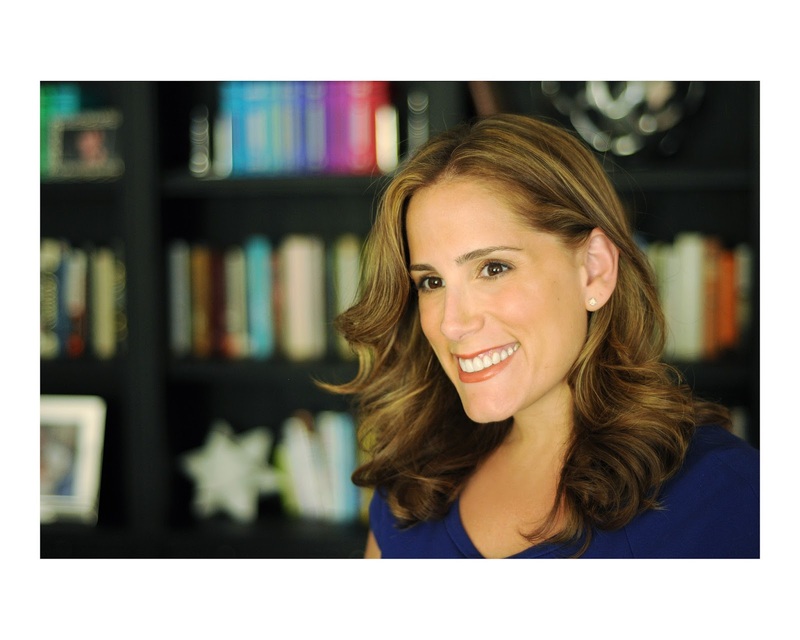 Julie Buxbaum is the New York Times best selling author of Tell Me Three Things, her young adult debut, and the critically acclaimed novels The Opposite of Love and After You. Her work has been translated into twenty-five languages. Julie’s writing has appeared in various publications, including The New York Times. She is a former lawyer and graduate of Harvard Law School and lives in Los Angeles with her husband, two young children, and an immortal goldfish. Visit Julie online at www.juliebuxbaum.com and follow @juliebux on Twitter. I need this book like yesterday. I am such a Buxbaum fan and failed at getting an early copy of this one. *SOB! * Great interview! I adored this book! I always love hearing what titles were almost picked and I have to say Instructions for Dancing was not anything I would have thought as a possibility. lol I need to read Tell Me Three Things still! I really need to read Buxbaum. I have had Tell Me Three Things for a while but still haven't found the time to read it. Her new book sounds great as well. Loved the interview! I can't wait to read this book!! I love Julie Buxbaum. Great questions! Thank you for sharing! Great interview, Alyssa! I always appreciate it when an author puts a lot of research into a project - you can totally tell, in my opinion. Now I'm even more excited to see what people have to say about What To Say Next, since it sounds like a real winner! This book sounds so cute! 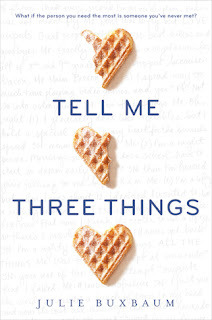 I haven't read Tell Me Three Things but I've heard some pretty stellar things about it. Awesome interview! I'm been thinking of picking up this book! It sounds lovely. Great interview, Alyssa! I've heard amazing things abour Tell Me Three Things, but I still haven't read it. I really want to read this one, too! Both of them sound like my kind of read! Great interview, Alyssa! I didn't know about the color change! !